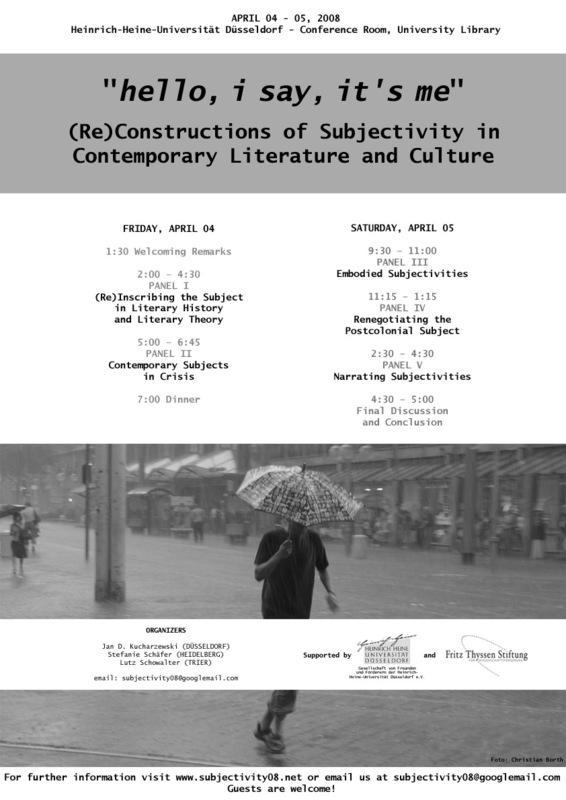 After the subject has been challenged, marginalized, fragmented, deconstructed, and pluralized in many postmodern modes of expression and thinking, there now seems to be a growing interest in reconceptualizing the relevance of subjectivity as a constitutive element in cultural production and in theoretical discourses. In contemporary literature, North American writers such as Bret Easton Ellis, Jonathan Franzen and Richard Powers have begun to seek a “reengagement with the world’s living concepts” (Powers) by reintroducing the subject as an essential factor of textual production and reception. Furthermore, works of up-and-coming authors such as Jonathan Safran Foer, Marisha Pessl and Jeffrey Eugenides share a focus on matters of fictional autobiography and a vital concern for the self. In literary criticism, this shift is paralleled by a turn to subject-based ethical questions originating from both philosophy and poststructuralist thought (Hale 2007). In contemporary media culture, New Media technologies offer a variety of possibilities for articulating and constructing subjectivity in virtual spaces, a fact to which the abundance of personal pronouns in generic product names – from ego-shooters to iPods, from MySpace to YouTube – attests. Finally, contemporary material culture continues to provide ample space for performances of subjectivity, reaching from fashion to advertising and beyond. The conference seeks to explore these sites of contemporary cultural production with a focus on literature, literary criticism, and cultural theory, but also inviting contributions from scholars working in the fields of media studies, art history, and material culture. Central to the conference are the following inquiries: Where and how are subjectivities (re)constructed in contemporary culture? How might these (re)constructions be assessed in the context of current debates in literary theory, cultural studies, philosophy, etc.? Are you interested in attending the conference as a guest? Please click here for a registration form in rtf format. To download the conference flyer, click here. The conference poster can be found here.